I know Canadian Feeders had really cheap feeders,but I heard they changed owners and my friend was ordering from them and was less then impressed with the quality and service.She told me not to order from them again.I used to order my bugs from there. WOW 2.99 a pinky.... here there only .99 ea and mice are 1.92ea and small rats are 4.27ea and it just goes up. I would start doing the C02 mmmm But still is is safe to feed a rep the C02 killed mouse? Just want to know cause i mean the mouse breaths in that C02. I feed my leo's pinky mice once a month. Yes it is safe to feed a feeder killed with C2O to your reptile. The C2O does not gather and remain in the tissues of the animal. Millions of reptiles are fed C2O killed feeder with no problem. Last edited by canadiancritter; 03-28-2010 at 11:56 AM. SWEET. now i got to see how would i do it lol. I dont think i can go out and buy one of them gas chamber things for cheep any where lol. You can make them apparently.I will see if I can find the link I was reading about it. Storage container (anysize you prefer) with a few holes so that the air may be displaced by the CO2 without the box exploding. Them either take a critter keeper or something of the like with holes, put the dry ice in (careful) and let the chamber fill up a bit. Another way is to have the dry ice in another container and connected to the chamber by a tube. I dont think you answered my question on how much you charge for your hissers. Just wondering. The reptile store here sells them for $3-$4 a piece. Where would you get the dry ice to do something liek that? I dont think Ive seen it being sold anywhere before. Apparently Walmart, party and grocery stores sell it. You can also buy cans of CO2 at places that sell paintball stuff, and online. I sale a pair for only $5 as in a male and female or two males or two females. Any pair lol. Thanks! Thats a good price! Wow, $25 each? Oh my, LOL. so just let me know if you ever want any. I can even toss a few babies in for free, if i have any at the time lol. I got to do a roach count soon any way so when i do that i'll count yup how many i can sale. I make sure i have enough adults left after i do a sale lol. 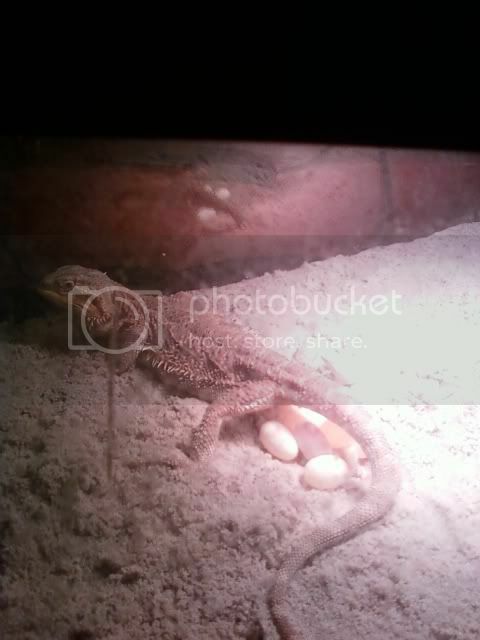 also my female Dragon Chaos Laid 11 eggs on the 29th!!!! only 10 looked good.